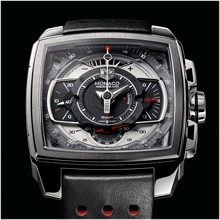 The fusion of TAG Heuer’s two most daring inventions in terms of movement and design will be auctioned on September 22, 2011 to benefit Duchenne muscular dystrophy research under the high patronage of His Serene Highness Prince Albert II of Monaco. Watch collectors around the world will be captivated by this technical revolution of the Mikrograph movement, a masterpiece of Haute Horlogerie encased in the iconic square shape of the Monaco. The Monaco design remains, over four decades after its scene-stealing debut on the wrist of Steve McQueen in the movie Le Mans, as cool and cutting-edge as ever. 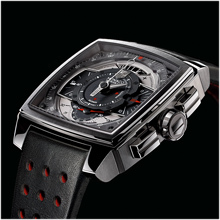 Presented in January 2011, the Mikrograph movement set a new milestone in “grandes complications”. Unlike a conventional chronograph, the time base is not dependant on the watch (hence the name “stopwatch”). Chronograph functions can be started or stopped independently of watch functions. The watch is automatically wound by means of a circular oscillating weight, and features a 42-hour power reserve. Encased in the squared shape that caught the watchmaking world by storm in 1969, this unique high-energy timepiece now redefines angles with a round dial stretching to the boundaries of the case itself. The flying central hand indicates the 100th of a second. The design is unexpected: the hand's round, open tip allows precise reading of the graduations, which are printed on a sapphire disc. The "/100" engraving is laser-cut by hand. 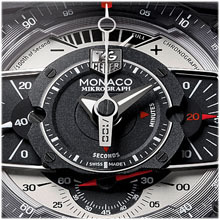 The counter at 3 o'clock indicates chronograph minutes on a rotating disc with 3 hands, graduated 0 / 10 / 20. The counter at 9 o'clock features a small second, also on a rotating disc with 3 hands, graduated 0 / 20 / 40 to facilitate reading. The third subcounter at 6 o’clock indicates chronograph seconds. Fire-red touches on the hands are reminiscent of the original Monaco’s motor racing style. The power reserve is indicated at 12 o'clock. The dial is a highly sophisticated multi-level design, alternating black lacquer and silver opaline finishes. Oversized screws on the dial evoke the engine of a sports car. A refined touch of black lacquer has been added to the oversized crown and chronograph pushbuttons. The black strap is in "Barenia", the highest quality of calfskin leather, and the red color in the perforations echoes the fire-red hands of the dial. For a very special watch, a very special watch box. Internationally acclaimed South African artist Paul du Toit has personally committed to create a unique piece of art to host the Monaco Mikrograph. The watch box art will be conceptualized and painted by this celebrated artist. Paul du Toit has gained stature in Europe following the award of a medal from the city of Florence in the Biennale Internationale Dell'arte Contemporanea. Renowned for using an impasto technique (thick industrial paste into which he scratched lines and images), it is now intrinsic to his style of automatic scribbling. As a firmly entrenched artist, Paul du Toit is able to dedicate attention to community project involvement. Philanthropy resonates deeply with him. Paul was involved directly with Nelson Mandela in fundraising efforts for his 46664 campaign for 3 successive years. Ink handprints on canvas of Mr Mandela's boxing hand were auctioned in Johannesburg and in London. In 2009, a mould of Mr Mandela's boxing hand, which was cast in a one-off unique bronze, was auctioned in London for $3.5m. In 2010, an imprint of both Mr. Mandela's hands were made into a relief sculpture and auctioned in NYC. All the auctions were to benefit Mr. Mandela's 46664 campaign. Paul du Toit’s superb watch box for the TAG Heuer Monaco Mikrograph is sure to add to the unique timepiece’s sale price at Only Watch auction.